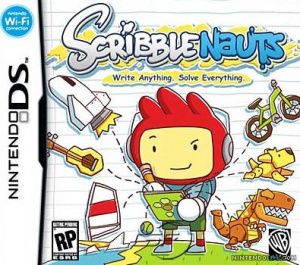 Scribblenauts Required Dedicated "Reading Team"
Five guys spent six months doing nothing but reading. "Yes! This book is the answer!" Those vaunted 10,000 conjurable in-game items in Scribblenauts had to come from somewhere, but we had always assumed they came from the fevered minds of the development team, bouncing ideas off each other and being all "creative". As it turns out, the truth is far less interesting. Developers 5th Cell - the talented minds and artists behind the DS's Lock's Quest and Drawn to Life - actually had a dedicated team of five staff spend six months doing nothing but research. That essentially entailed reading a lot of books, magazines, websites and anything else to glean ideas for the bizarre and comical items featured in the game. Putting the equivalent of two-and-a-half man years' worth of reading into the game seems to have paid off - first impressions from other press sites has been very positive so far. Rest assured we'll bring you a full review of Scribblenauts as soon as it hits DS later this year. Thanks for doing an article on this game James! I absolutely cannot wait for this to come out! It looks really awesome! Easily one of my most anticipated games of 2009! You're welcome! I'll be honest, it's totally slipped my radar even though I really liked Lock's Quest, but having seen it in action I'm really intrigued by it, even though I doubt my vocabulary is enough to come up with the 10,000 words they've included! awesome, absolutely awesome, I'm getting this the day it comes out! Day 1 purchase. My most wanted game. Any game with fail cat is full of win. They've got longcat in there. Enough said. of course they did that, I swear the guys said that they were doing that in an early interview i read on IGN. I wouldn't be surprised if they just sat there with a dictionary going through A-Z typing in all the nouns. Can't wait for this game, I really hope they make some kind of freestyle mode like Little Big Planet. After reading about the E3 impressions from various sites I"m very excited about the game. This game looks so rad. This game makes me consider finally getting a DS. Or at least buying one for my girlfriend, thereby accruing many bonus points, and then "borrowing" it after she tires of Nintendogs. This sounds fun. ... It does. Leave it to me to find something they'll have overlooked, though.